Commitment to character, story, dialogue, music and art, are four of the pillars that often support any argument as to why Avatar: The Last Airbender is a devastatingly enjoyable experience. In virtually every episode, you’re guaranteed to see an impressive debut of at least one or two of these attributes, and in the best episodes of the show, all of them. Season Three is replete with a number of such shows and “Sokka’s Master,” may well be the very first one encountered in the concluding season of Avatar. Beyond the improbable timeline of advancement, an episodic version of a cinematic training montage, it’s an episode that embraces the insecurities that often haunt those surrounded by others who are gifted in one way or another. In the selected weapon shop, Sokka explores all matters of weapons, trying to pick out the best one. Sandwiched in between his indecisiveness is a jab by the Avatar creators at merchandise demands on the show to give Aang armor to wear as an accessory for a toy line – the idea is astutely mocked. Sokka eventually eyes a finely crafted sword and learns from the shopkeeper that it was forged by the greatest swordmaker in the world who lives just above town. With the encouragement of his fellow gang members, Sokka embarks on his own to request the chance to learn from the swordsman named Piandao. By this point in the episode, it has become very clear that the direction in the episode is a cut above the usual Avatar episode from the frame composition. Multiple times scenes are constructed to guide one’s eyes down implied and express lines in the background or the characters are arranged to work with the background, such as when the group are dining and Katara, Aang, and Toph are arranged as listed around a table, tallest to shortest with the lines of a canopy guiding the eye down the line of the trio to Toph. Likewise, the backgrounds are given a high level of attention than your normal episode, be it the cityscape with Piandao’s ‘castle’ perched above it or the beauty of the interior of the swordsmith’s home. In contrast to the due consideration given to the production of the A storyline, the episode is punctuated with brief interludes of Uncle Iroh’s imprisonment in his dungeon cell. The B storyline, given its brevity, can quickly be summarized here before returning to Sokka’s apprenticeship. Each scene establishes two things: Iroh is in the process of physically conditioning himself by various exercises constrained by his current situation behind iron bars and is engaged in fooling the guards that he is quickly spiraling into a drooling mess of a mindless prisoner. The only words spoken in each scene come from the warden/guard who brings him his food, always said with venom and ridicule in mind. Iroh’s silence serves two points. First, it’s easier to play the role of someone too broken to speak than to speak to the expectations one might have of someone mentally degrading. Second, it draws upon the fact that Iroh’s voice actor, Mako, had passed away by the conclusion of Season Two, and while his understudy and eventually replacement will soon step into those extremely big shoes, this decision both honors Mako by showing he’s not easily replaced and provides a silent tribute to his effectiveness in the role. 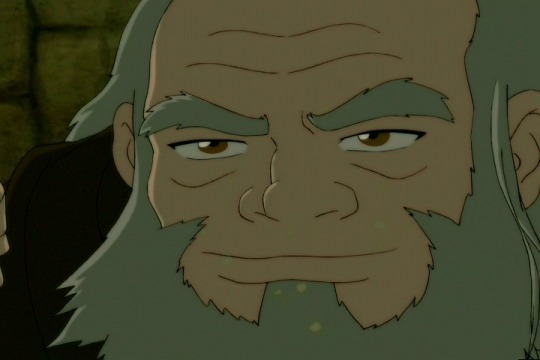 By the conclusion of these scenes, Iroh is revealed to be in an incredible shape, no longer the pouch bellied old man from the first two seasons, but a lean heavily muscled man capable of easily pulling off one handed chin ups. Castigated by the guard for falling so far from the grace and honor of being the Fire Nation’s most capable general, Iroh proves to the viewer that he remains just as clever a strategist in preparing for the future. As Iroh’s training montage was essentially broken up over the duration of the episode, it also segmented Sokka’s montage of sorts. Piandao is introduced in the middle of calligraphy and accepts Sokka as his student based on Sokka’s humility and willingness to admit that he has a lot to learn. Piandao is voiced wonderfully by Robert Patrick, who conveys to the character a voice full of confidence and wisdom. This decision works well as Piandao instructs Sokka in the important elements of swordsmanship, beginning with an introduction to how the sword becomes a part of the swordsman’s body (not a second head, more like a longer arm). 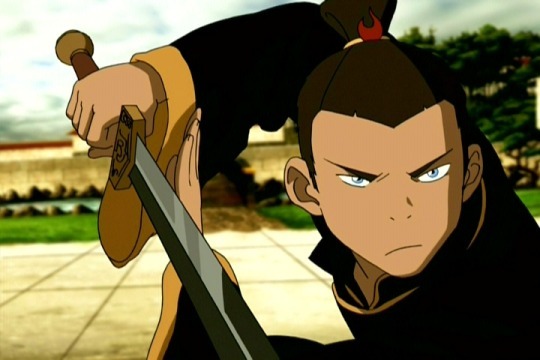 One of the key elements the swords master immediately imbues on Sokka is the importance of creativity or specifically, imagination which allows a true master to use their weapon in countless ways. This leads to instructing Sokka in calligraphy and a prime example of Sokka’s asymmetrical manner of thinking. 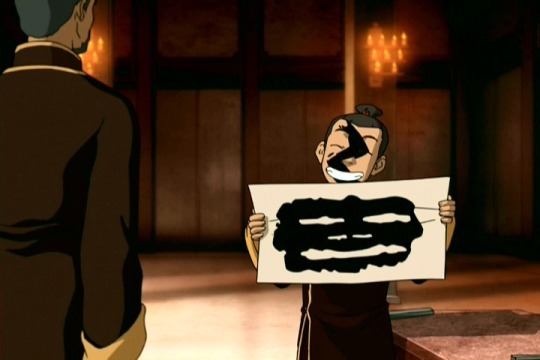 When informed that calligraphy, when done well, imparts the writer’s personality on the paper, Sokka absorbs the instruction as imparting one’s personality, if not words on the paper in front of him. Ink is promptly painted across his face, and the Southern Water Tribe member runs his face over the surface of the paper like a human printing press or stamp, leaving a smeary face on its surface. Next is a lesson in landscape painting, a skill Piandao tells Sokka, which helps a warrior immediately understand the lay of the land. 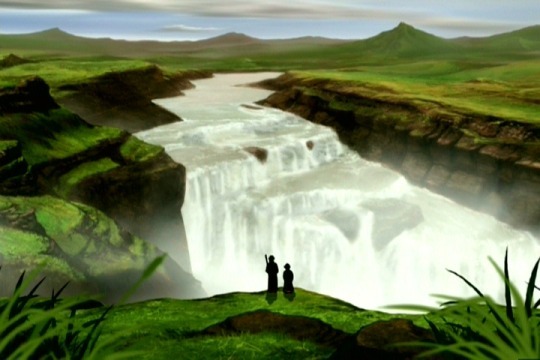 Sokka is offered a quick glimpse of a beautiful water fall (based off a real water fall) and then told to paint what he can from memory. Sokka quickly holds up a finished product to which his master states with a hanging question mark, “You added a rainbow?” After both activities, we are left with the impression of something between disbelief and exasperation by Piandao, but the lessons continue. Several scenes are given over to Aang, Katara, and Toph, who are left with nothing much to do while Sokka trains with Piandao. While Sokka’s absence is based on his own belief of not being special, these scenes highlight the role that he plays in the group’s dynamics and how quickly the remaining trio find themselves missing his presence. A double layer of humor follows through within them as various members try to replicate his cynical or sarcastic humor, but fail miserably in doing so. In the failure is the joke, but also subtle moments of appreciation for Sokka’s presence and how he’s definitely a special member of the group. 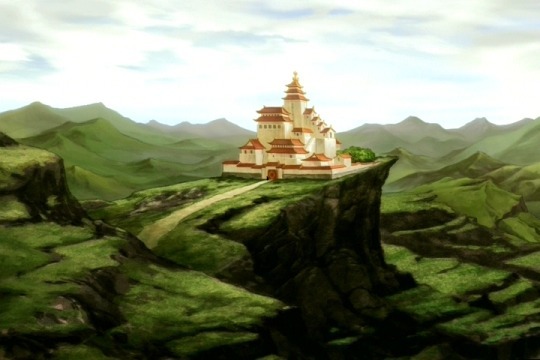 Back at Piandao’s, Sokka receives his second to last lesson, concerning rock gardening and learning to use one’s environment to one’s advantage. Sokka’s immediate effort is to build the stone and moss equivalent of a deck lounge chair, wherein he asks Piandao’s servant (who has been his sparring partner throughout the episode) for a drink. A hint is provided with concern to Piandao’s examination of Sokka’s abilities when he requests a drink as well from his butler. Only one lesson remains, the task of a swordsman to forge his own weapon. Sokka is offered a selection of steel ingots to forge his sword with, but instead, to Piandao’s pleasure, he requests the opportunity to fetch his own metal. On his mind is the meteorite from the start of the episode and he reappears to the delight of his friends in the camp, who have quote obviously missed their Sokka. Notably, Toph turns and blushes, which combined with her elated response to thinking Sokka had dived into the water to save her in “The Serpent’s Pass,” lends a reasonable idea that the daughter of the Beifong clan might well have a continuing crush on Katara’s brother. 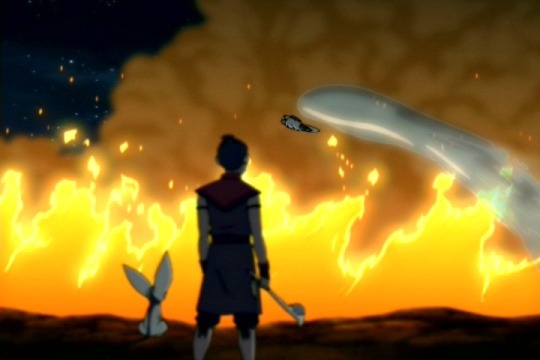 With their help, Sokka manages to wrestle the meteorite back to Piandao’s where he works tirelessly overnight overseeing its smelting into a form to craft a blade. The selection of the meteorite serves yet again as evidence of Sokka’s out side of the box thinking. The next day Piandao congratulates Sokka on having what he needs to become a great swordsman, so long as he practices on what he’s been instructed and offers him a jet black sword forged from the meteorite. The sword offered in front of him, Sokka falls to his knees and tells his master that he is unworthy of such a gift given to a deception from when he first arrived. As Aang claimed to be from the Fire Nation colonies in “The Headband,” so did Sokka to explain his very un-Fire Nation name to Piandao. As well established by this point, Piandao is no fool and tells Sokka he was aware of this from the beginning and tosses the sword at his student, telling him he had better defend himself. What follows is a rather lopsided duel throughout which Piandao forces Sokka into successive situations where he must apply everything he was instructed over the past couple days, be it taking the high ground in defending against Piandao’s attacks or hurling sand at his eyes in a desperate move to use his surroundings. After Sokka has successfully and unknowingly passed Piandao’s final test of his swordsmanship, the two finally and truly bid their farewells with Piandao giving Sokka his real stamp of approval. In the farewell, Piandao lets Sokka knew that he was aware of Sokka’s water tribe origin immediately, and that his friend Aang was the Avatar. The gang is surprised that a Fire Nation citizen would help the avowed enemies by instructing Sokka in the way of the sword, to which Piandao informs them that the art of swordsmanship, among all arts, belong to the world and not to any one nation. 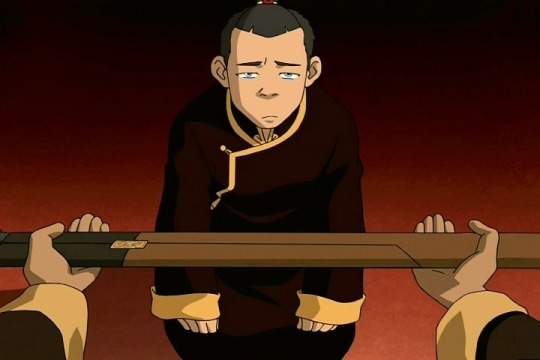 One parting gift to Sokka is a White Lotus Pai Sho tile, an item that somewhat bewilders him and everyone else, but is an immediate callback to Iroh and the White Lotus Society, revealing (if Piandao’s décor wasn’t an fast give away, as well his philosophy on arts) that the sword master is a member of the club. “Sokka’s Master,” is an important episode of the third season for a variety of reasons. First, it’s a dedication to Sokka and his development as a character, who as the only non-bender in our group of heroes, is provided a chance to demonstrate physically that he is or can be as special as anyone else. 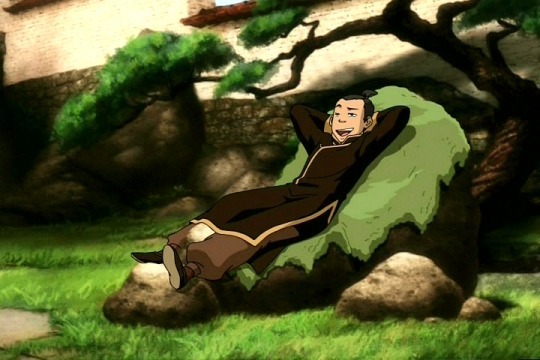 Ironically, while his absence provokes reflections on Sokka’s sense of humor, it somewhat ignores the mind for strategy that he has exhibited repeatedly throughout the series. Cleverly though, Aang’s, Toph’s, and Katara’s, attempts to fill the humor void are nice reflective glances at their own personalities and characters. Second, it’s a love letter to the Asian martial arts that have defined the show through the forms that compose the variety of bending styles and elements. Through the visualization of Piandao’s swordsmanship, a message of fondness is conveyed to the viewer. Third, the art and direction of the episode is simply superb for televised animation in general, but even for Avatar: The Last Airbender. It’s gorgeous and deliberate, a prime example in the level of care given to the show’s production. Ultimately, “Sokka’s Master,” should easily exist as one of the top three shows upon which one can rely upon to understand Sokka’s character, and additionally, the show’s as well. As an additional note, the majority of the images I rely upon to help illustrate these recaps come from Piandao.org. The owner of the site has never required any attribution for the use of the screen caps, but nonetheless, their work has made my life easier. So thank you, Piandao.org!